Lawrence House | Launceston Then! Castle Street looking towards Lawrence House in the 1960’s. The Lawrence’s of Launceston were descended from the Padstow family of that name and it was Arthur, born at Cubert in 1692, that was the first to arrive in Launceston. He was placed by his uncle with Mr. Samuel Lyne, an attorney and one of the most zealous of the Launceston Tories. Arthur qualified as an attorney and took up residence in Westgate Street with his wife, Judith nee Bligh daughter of Charles Bligh, of Brockle, South Petherwin. He took an active role in Launceston’s government, becoming mayor in 1743. When Arthur died in 1750, his son Humphrey succeeded in his practice and it was he who had Lawrence House built in 1753 as his town residence. In the same year he had married the heiress of Landue, Charlotte Kendall. In order to obtain the site on which to construct his new house, Humphrey had to purchase property from different owners. The site covered the area formerly occupied by two dwelling houses obtained from Emblyn Eliot as well as the tenement obtained from John Trevaskes. With this property Humphrey Lawrence also owned ‘forty feet of ground in length and six feet in breadth lying before the dwelling house….where the pallisadoes are.’ This is the piece of ground now set in cobbles, and a deed clearly shows that this is not part of the highway. Humphrey Lawrence was said to have had ‘one tenement with the appurtenances in Castle Street…..which the said Humphrey Lawrence, deceased, had of the surrender of one Ann Burton and which said tenement the said Humphrey Lawrence, deceased, lately erected an Office.’ By 1803 this office was ‘in the occupation of Henry Gilbert, afterwards of Mary Gilbert, widow of the said Henry Gilbert, is now converted into a stable.’ This was probably the building at the end of Castle Street used by Caroline Pearse and Rev. T. N. H. Smith-Pearse as a coach-house (below left) and later by Mrs. Gladys Kittow as a garage until she passed it over to the National Trust. One of the tenement’s purchased by Humphrey Lawrence was ‘next and adjoining to the Vicarage House of the Borough.’ This would suggest that the Vicarage House stood on the site of either the present No. 7 or the present No. 11. For hundreds of years the Corporation held the patronage of St. Mary’s. They appointed and paid their minister’s, organist and others. They kept the fabric in repair and entirely controlled the affairs of the Church. This responsibility continued until December 14th, 1847, when they sold the advowson to the Duke of Northumberland for £400. But they did not then sell the old ‘Vicarage House of the Borough,’ which they owned in Castle Street. 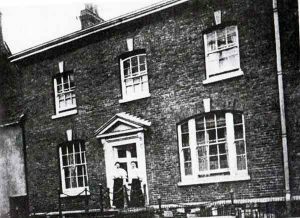 In 1865 the Corporation sold the Vicarage House to Caroline Pearse (below left). Humphrey Lawrence was Mayor of Launceston in 1756,1765,1776 and 1783. He was the local agent and advisor of the Duke of Northumberland and was the man to whom, in October, 1787, the Duke wrote the manuscript letter, now in the Council archives, saying that Mr. Farnham had offered him Mr. Woolcombe’s votes in Newport for £1,500, and asking his advice. But Humphrey was a sick man and his son, also called Humphrey, replied for him, stating that his father thought that ‘ One Thousand Pounds is a great deal more than the value’ of the lands in question. Humphrey senior died in February 1788 and left his property to his son Humphrey junior. Humphrey junior was deemed much too young to undertake the responsibility of the Duke’s local representitive, and the agency was transferred to the Lethbridge’s of Madford House. Although Humphrey Lawrence junior was only nineteen years of age at the time of his father’s death, he married Harriet Morshead of Catuther, Menheniot, on June 10th, 1788 and they resided at No. 9, Castle Street for many years. Humphrey Lawrence junior died at Whitley, Lifton on April 2nd, 1811 aged 42. He was interred in the family vault at St. Mary Magdalene Church, which was the last internment within the building itself. Meanwhile the Castle Street house had been occupied by the Rev. Richard Cope as tenant in 1813. The Napoleonic wars were raging during the early years of the nineteenth century, and No. 9, Castle Street was used as one of the headquarters of the French prisoners who were detained in Launceston. These men were officers on parole, and some had batmen with them. They were billeted on the better class families, many of whom lived in Castle Street. They received an allowance of half a guinea weekly from the British government, but nothing from the French government; in some cases they were also in receipt of money from private sources in France. They had a comparatively easy life, provided they reported once a day and did not go more than one mile beyond the borough boundary, they were almost free to do as they liked. The next occupant of the house, was Thomas Pearse. It remained in his possession and that of his daughter until the beginning of the twentieth century. Thomas was the son of William Pearse of Halwell near Davidstow. On March 14th, 1797, he married Grace Spry of Thrushelton in Devon. They had one son, William Spry Pearse born in 1805, and one daughter, Caroline, who was born on November 22nd, 1809. Thomas was an attorney and Justice of the Peace for Devon and Cornwall. He was Chairman of the Board of Guardians, but is remembered chiefly as an active politician. He also played a large part in the negotiations leading to the construction of St. Thomas Road, from the present Town Hall to the National School. In 1828 Thomas was joined in his law firm by Northmore Lawrence, Humphrey Lawrence junior’s son. Northmore who was born in 1801, lodged at first with Joseph Beard Geake, a draper in High Street. On April 29th, 1830, he married Maria Hosken Prynne Andrew and they set up home at ‘Castle Hill House’ opposite No. 9, Castle Street. Northmore Lawrence took a very prominent role in the affairs of the town. He was not a member of the old corporation, but at the first meeting of the reformed Town Council on January 1st, 1836, he was elected one of the first four Aldermen. He was Mayor the following year, 1837-38, and again in 1849-50. But his real claim to lasting fame is his interest in the town’s history. He was always collecting manuscripts including the Rental Book of Priory of Launceston for 1474. This collection has proved invaluable over the years for many historians and has helped map Launceston’s past. Northmore Lawrence died on October 29th, 1878, aged 77. His memory is perpetuated in St. Mary’s Church by a stained glass window erected by his widow, and in the Guildhall by the ornately carved mantelpiece, which bears his name and the date 1881, the year in which the building was opened. 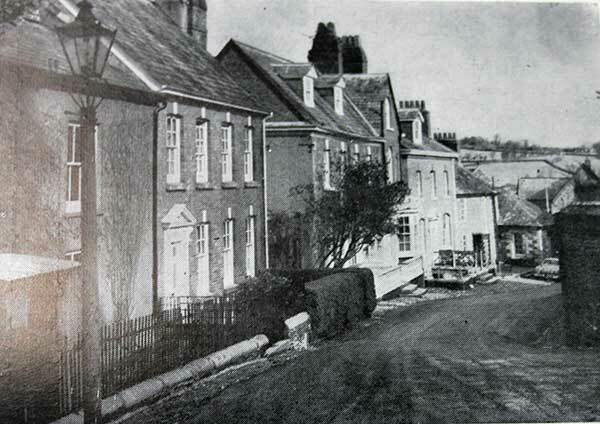 Returning to the Pearse family, Thomas and Grace both died either end of the 1850’s, and his property in Castle Street and a considerable acreage of land in the parish of Davidstow passed to his unmarried daughter, Caroline. At the time No. 9 was not as large as it is today. There were two ground floor windows on the east side, down the street, were two small houses, spoken of as cottages, connected to the main building by an internal passage to avoid the necessity of going into the street. 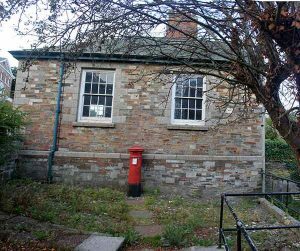 The nearest of these was used by Thomas Pearse and his partner, Northmore Lawrence, as their office; the further was the residence of James Martin, who had come to Caroline Pearse as a coachman and subsequently became her steward. He married, as his second wife, Jane Cory, Caroline’s lady’s maid. In 1885, their cottage, which Caroline had bought twenty years earlier, was demolished and on its site there was built the present house, now known as No. 11, for the Martin’s. They both continued to live there for the rest of their lives. Both died before Caroline Pearse, and, after their death, their daughter, Caroline Jane continued to live there. Caroline Martin married William Bailey the former proprietor of the Temperance Hotel in High Street. They continued to occupy No. 11 until shortly before her death in 1938, by which time she and her husband had moved to No.45, Dunheved Road. Castle Street in the 1900’s. The house beyond No. 11 was also the property of Caroline Pearse. This is now known as No. 13 and was for some years the residence of the Rev. Jesse Bamford, the Congregational Minister. Caroline had originally attended St. Mary’s Church, but after some disagreement she left and joined the Congregationalists, with whom she remained for the rest of her life, being buried by one of their ministers, the Rev. William Miles, in the Bowling Green cemetery in Dockacre Road. 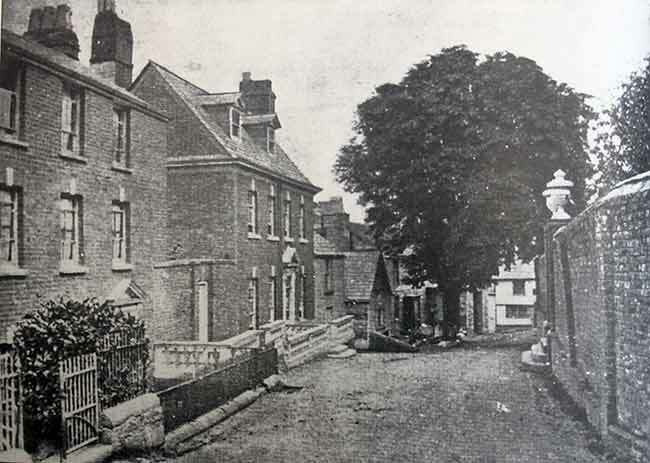 Outside No.13 stood a large tree (seen left also in this picture can be seen a white-washed cottage which is on the east side of Northgate Street. This was demolished in 1962 and Castle Street was extended along its footings in 1964). Caroline Pearse was the author of many books and magazine articles with her first work published in 1848 (‘Bees and Beehives’). She later turned to writing more on scriptural subjects such as ‘Apostolical Baptism’. Caroline was extremely generous with her wealth. She kept a list of deserving poor people, and every week she would give each one of them a joint of meat and a loaf of bread. At Christmas she would have a very large joint of beef cooked and would carve it herself and distribute it to them; they came to her house for it. When one of those on her list died, another name would be added in place of the deceased. She kept a large staff, a steward-coachman, two gardeners, and three women in the house. Prominent among her outside benefactions is the Church porch at Davidstow, which she rebuilt at her own expense. The friendship between Caroline Pearse and the Lawrence’s developed as the years went on, in particular becoming devoted to Northmore’s eldest daughter Charlotte Pierce Lawrence, who was born in 1832. Although twenty years older than Charlotte, Caroline acted as a bridesmaid at her wedding to the Rev. William Hart Smith in 1853. When Caroline Pearse died in 1903 at the age of 93, No. 9, Castle Street was left as a life interest to her friend Charlotte and her husband, on condition that they lived in it, and on their death to their eldest son, the Rev. Thomas Northmore Hart Smith absolutely, if he assumed the additional surname of Pearse and would become Smith-Pearse. They complied with these conditions and in due course the parents took up residence at the house, which thereby returned to a female branch of the Lawrence’s. Charlotte did not live long to enjoy her new abode dying in 1905 with her husband, William, dying in 1913. Thereupon their son, Thomas Northmore Hart Smith-Pearse, who had been headmaster of Epsom College since 1889, retired in 1914 and went to live in Castle Street. He erected the porch at the front door and demolished the cottage that had previously served as an office, and in its place added an extension to No. 9, the part containing the big bay window and other floors above. Smith-Pearse also rebuilt the house at No. 7. He moved the front door from the east end to the west end, nearer the Castle Green. Thomas died in 1943 after occupying No. 9 for nearly 30 years, and was buried at St. Stephen’s Church. His only son, Lawrence, then took possession of the house, selling it to Dr. J. G. C. Taunton in October 1946. It was to be Dr. Taunton’s retirement home. On April 27th, 1955, the personal representatives of Dr. Taunton conveyed No. 9, Castle Street, to Horace Kittow. As soon as Horace took possession of the house, he set about bringing the house back to an excellent state of repair, however, he did not live long to enjoy the fruits of his work, as he died on October 3rd, 1958, and was interred at Launceston cemetery. His widow, Gladys Winnifred Kittow, had always taken a leading part in the affairs of the town, besides being mayoress during her husband’s years as mayor, she was interested in the many activities which flourished in the town, particularly in education. For many years she was Governor of the Horwell Grammar School for Girls, and for some time acted as Chairman of that body, as well as being one of the managers of the Primary Schools. In 1942 she was added to the Commission of the Peace for the County of Cornwall, and continued to act as a magistrate until 1960, when she was compelled to retire due to ill health. She continued to reside at No. 9, Castle Street until she gave it to the National Trust in the autumn of 1964 (below), with the proviso that the Town Council should be offered a long lease of the part she occupied, for their use as a civic and cultural centre. The furnishings and pictures were also given to the Council. 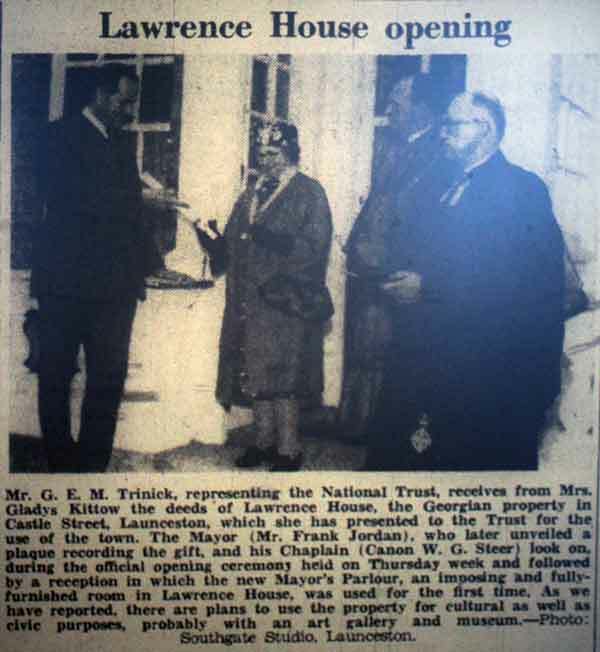 The house was subsequently renamed ‘Lawrence House’ and for the last fifty years has been the home of the Launceston Museum. Gladys Kittow handing over the deeds to Lawrence House in April 1965.